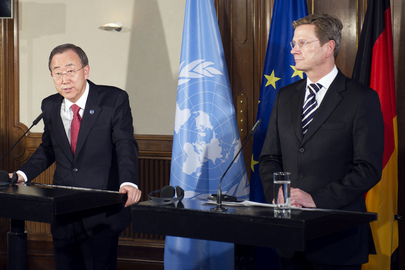 UNITED NATIONS, February 11 -- When German Foreign Minister Guido Westerwelle took questions from the press at the UN on Friday, he began with a statement and then two questions, in German, about Egypt and Hosni Mubarak. When Inner City Press asked him for Germany's response to demands that it close the Hamburg-based European- Iranian Trade Bank AG (EIH), Westerwelle refused to answer the question, saying that on this “historic day” he would only speak about Egypt. Then, in German, he spoke about Tunisia as well. Video here. Westerwelle is not only or even mostly in the United States concerning Egypt. He came to speak at a Security Council session on security and development, and to lobby for a permanent Council seat for Germany along with the other three members of the so-called G-4 group. Some say that a Permanent Member of the UN Security Council should be able to speak about one than one issue, particularly including questions about its own policies. One would think, even with his mind on Egypt including the reports that Germany offered medical sanctuary to Mubarak, that Westerwelle provide his response about EIH Bank. We'll see. Footnote: since Germany got its two year seat on the Council, the German Mission has held more press availabilities than before. But unlike with the Indian mission, most by the German mission are off the record, which is not the way these questions should be answered. Watch this site.